Invented by a Frenchman towards the end of the eighteenth century, absinthe was not originally known as the swirling, intoxicating drink favored by boulevardiers and artists. Dr. Pierre Ordinaire meant the cool, green liquid, concocted around the bitter-tasting wormwood, to be a digestive aid. 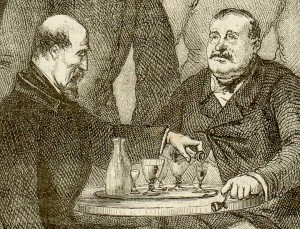 With the first stirrings of the Industrial Revolution, the population of Paris swelled alarmingly, and due to a combination of low wages, long hours and overcrowding, absinthe, cheap and easy to obtain, became the liquor of choice for working-class Parisians. By mid-nineteenth century, with the Pernod Fils distillery churning out some 20,000 liters per day, the drink soon became integral to the chaotic Bohemian lifestyle, its virtues extolled by no less than Van Gogh and Degas. So integrated the drink became, the cocktail hour in Paris became known as l’heure verte–the green hour. As the century progressed, absinthe consumption had all but supplanted wine and brandy in France, and by 1908, Continental distilleries began shipping their product to all corners of the globe. It became the primary drink of the upper classes in London, and soon spread to America–New York to San Francisco, but most enthusiastically taken to in the “Little Paris of America”: New Orleans. The drinking of absinthe was a ritual, rightly aided by a host of accouterments: the absinthe glass, the absinthe spoon, and the water drip. 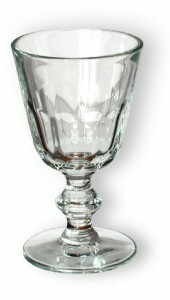 The Absinthe glass was generally made deep, for the amount of absinthe poured into the glass, and sturdy, since the brasseries (bars) were rowdy, and cafes could ill afford to have their patrons break their glasses. 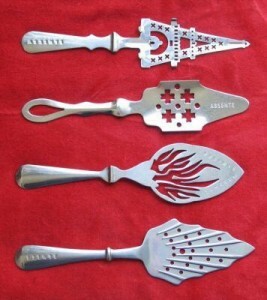 The Absinthe spoon was made of silver-plated base metal, and featured decorative slots through which the water dripped through, soaking the sugar, and into the absinthe. The most common designs for the slots were pipes, arrows, stars, clovers, clubs or crosses. The water drip, its use very important to the preparation of the drink, came in the form of a carafe, a fountain, or a brouilleur, with the fountain being the most popular. Made of metal and glass with two to six tiny spigots, the drinker would turn on the tap and out would gush the ice-cold water over the sugar cube sitting on the spoon and into the glass. Other accessories included spoon vases, sugar dishes, saucers (whose surfaces featured the price of the various drinks served), and the topette. The topette, a small- to medium-sized glass bottle with an inverted conical shape featured numerous measuring marks for the efficient doling out of absinthe shots if one went to a bar or cafe in a group. How to prepare the absinthe? After gathering the various items, one would take the absinthe bottle and pour one shot into an absinthe glass. The absinthe spoon was balanced atop the glass, and on the spoon, a sugar cube. 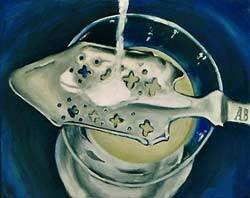 The water was poured over the sugar cube until the absinthe turned a white, sage or pearly-gray color. Absinthe was called “the green fairy” not only because of its color (produced by the addition of chlorophyll), but also its intoxicating, whirlwind effect upon its imbibers. It can be assumed that the green color of the drink colored the artists’ view during their intoxication. Built around anise, a sweet, very aromatic plant with the slight taste of “licorice”, absinthe rightly takes on the flavor of its base.But what comes up, must come down, and with the rise of the temperance movement, absinthe was seen as a menace more troublesome than regular alcohol. Leading doctors, already worried about the growing dependency on alco hol and drugs in the Western world (the upper classes freely indulged in “morphine tea parties”, cocaine use, and ether-soaked strawberries, as well as alcohol overindulgence by the 1880s), began to study the effects and dangers of these dependencies, and when two murders in Switzerland were linked to la fee verte, the death knoll began to ring for absinthe. Becoming the first country to ban the green drink in 1910, other countries were eager to follow suit, America banning absinthe in 1912, and France in 1915. Absinthe substitutes appeared on the market soon after the bans, but WWI, and its new generation found the drink unpopular, and for decades, absinthe was virtually eliminated. Towards the end of the 20th century, absinthe slowly emerged from obscurity, aided by movies such as Moulin Rouge, From Hell and Dracula, the first absinthe bar opened in South America, soon spreading to other countries despite the bans. 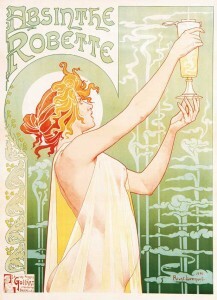 These days, those interested in this drink of La Belle Epoque can partake of absinthe in select bars across the country.